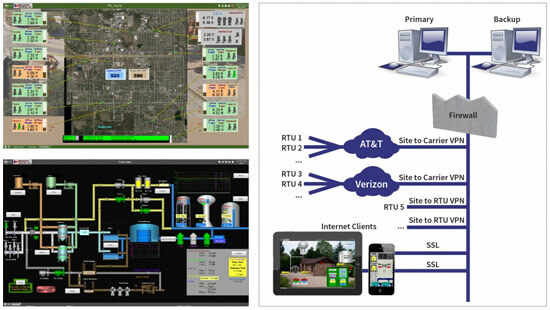 By updating existing infrastructure, water and wastewater facilities’ have the ability to collect and process significant information via Metropolitan’s cloud-based Supervisory Control and Data Acquisition (SCADA) allowing management and operations personnel to make better, informed decisions, while maintaining up-front costs. As the water and wastewater industry looks ahead to the future in communications methods, municipalities are also in the process of updating its aging infrastructure with more efficient, reliable and secure equipment. Metropolitan Industries is a leader in providing innovative and cost effective solutions to assist in the upgrade of these aging infrastructures and control facilities. Recent Metropolitan projects consist of new design and implementation of master SCADA systems at various water and wastewater treatment facilities throughout Illinois. The lift stations and wells (previously checked manually) were upgraded with radio systems and/or cellular communication to allow for remote monitoring and control access. The challenge was to implement a complete SCADA system to collect and process the status and data from a range of 5-30 lift stations per municipality. Processing the data included requirements to immediately process alarms and dispatch service personnel, provide a graphical display overview of the entire system, historically store the data, trend data on demand, and provide a remote information window for management and operations to make informed decisions. The new SCADA system is tailored to provide full system access from various locations within the treatment plant or collection system, expand data storage capacity, improve data protection and backup, enhance alarms and security, improve functionality and provide redundancy. Station updates include adding weather stations, meter vaults, lift stations, water towers and reservoirs and potable pressure water booster stations. An innovation recently introduced by Metropolitan is its own cloud-based remotely hosted SCADA, the MetroCloud. Virtually, any infrastructure can purchase this system to process and control equipment monitored at the touch of a button, directly from a smart device. Metropolitan installs a remote host and customizes it to the specific municipality or owner’s specifications. The remote SCADA hosting is supported by Metropolitan and its partners, ensuring that the latest security updates are in place offering secure communication between the master SCADA system and the remote stations. Metropolitan worked with three different Public Works Departments that recently underwent a similar transition with its wastewater collection network’s SCADA system. 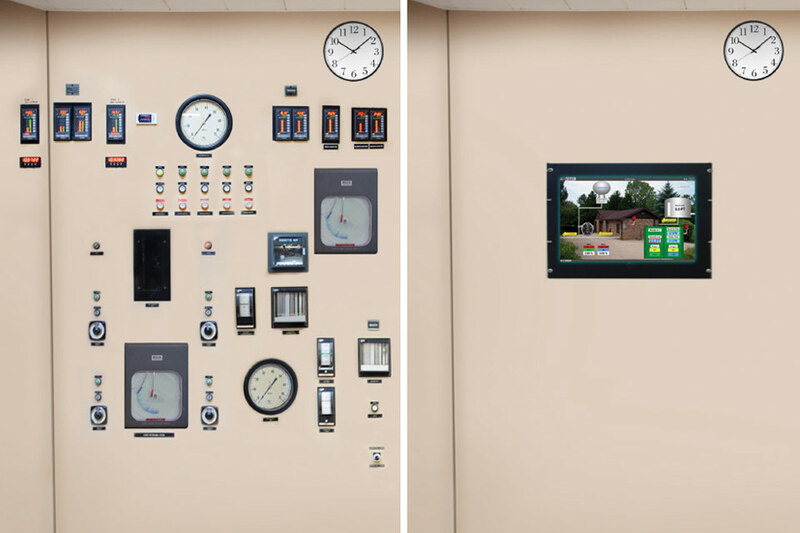 Left, Top & Bottom: Two examples of SCADA overview screens for entire city systems. Right: VTS is installed on Amazon’s remotely hosted server instead of on customer owned PCs, allowing for more security. The primary goal for the City of Chicago Heights, Ill., project was to improve the city’s communication system and update the old infrastructure, including the master SCADA computer and software. Older controls were retrofitted along with replacing unreliable and slow telephone lines, which was the only means of communication between the public works department and the system. The new update, which replaced 24 phone lines, is now operating on cellular data, eliminating the existing copper infrastructure, which was very expensive to maintain and operate. In order to eliminate the high probability for failure, Metropolitan updated 20+ year-old PLCs with the latest technology, making the system more reliable, cost-efficient and faster. The controls are completely updated with a color touch screen, SCADA controls, remote communication and a wireless communication company to handle cellular communication. This project was a turnkey, design-built directly for the City of Chicago Heights, Ill. Metropolitan supplied all of the equipment for the job including the water pump station upgrades, lift stations and cellular equipment, allowing remote access to each site. Another part of the project was to focus on years of previous revisions that were not maintained. Metropolitan cleaned out all the wires that were outdated and created as-built electrical prints identifying the remaining components and the electrical function of each panel. The organized electrical prints will give any future service technician a clearer picture for troubleshooting. The Village of Park Forest, Ill., was a retrofit upgrade of the existing controls, SCADA computer system and communications methods. The water treatment plant has over 12,000 data tags making it a complex project that was in need of upgrading because the existing SCADA system had not met the owner’s expectations. The first phase of the project began with a new master SCADA computer with a cellular modem installed at the treatment plant. This was crucial since six remote wells pump water to the treatment plant to then fill three elevated tanks. The new SCADA communication was upgraded to monitor and maintain station vital data so failures are detected before problems occur. Report generation and spreadsheet data collection was easily incorporated into the new SCADA system allowing the operator to view directly on the screen whether or not the valves and tanks are being optimized. This was updated by adding new surveillance and new VFDs at Well 6 to enable installation of a smaller standby generator. The project for the Village of Glenwood, Ill., was a complete update from its existing communication. The existing system relied on old copper phone lines and there was no master SCADA computer. Since the advancement in smart technology, municipalities have started to modernize the water facilities once again. The Village of Glenwood, Ill., saw this as an opportunity to improve the village’s aging infrastructure. The village updated to Metropolitan’s M2M cellular plan, installed a master SCADA computer and also added a weather station with the ability to monitor wind, precipitation and temperature. For example, the weather station is capable of tracking rainfall, allowing the operator to prioritize storm water management options by studying infiltration and identify trends from the study. Upgrading the communications methods at a treatment plant, collection system and/or distribution network are some of the most essential components in the improvement of aging infrastructure. The new technology installed in Chicago Heights, Park Forest and Glenwood will facilitate faster learning of the systems operation as the water industry is continuously changing and products and equipment become more energy efficient and user-friendly with the advancement of smart technology.